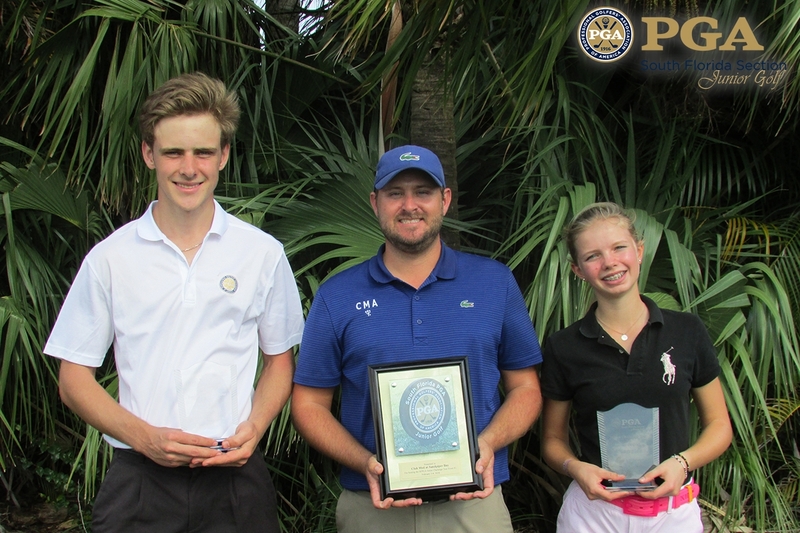 February 4th 2018 - ATLANTIS, Fla. – This weekend, the South Florida PGA Junior Challenge Tour presented by The Honda Classic held Challenge Event #1 at Club Med Sandpiper Bay in Port St. Lucie, FL. This event was the first Challenge Tour Event of 2018. Leif Sinclair of Stuart, FL entered his first South Florida PGA Junior Tour event of his career this weekend. After two days of rainy and windy conditions, Sinclair managed to capture a victory in his first tournament. Sinclair entered Sunday’s final round tied for the lead with Port St. Lucie, FL resident Callen Hoskins. Hoskins had the advantage as Club Med Sandpiper Bay is his home course, but this was Hoskins first time playing in the final group on Sunday. Both juniors battled through nerves all day, but in the end Sinclair was able to edge out the victory after rounds of 71-73. John Marshall of Miami, FL took home the boy’s 13-15 age division, while Miami Beach, FL resident Yoshi Petetersson took home the boy’s 16-18 age division. Ana Maria Lopez of Weston, FL opened up round one with a 7-over-par 77 to put herself on top of the girl’s division after day one. Valentine Savioz of Port St. Lucie, FL found herself four strokes off the lead after Saturday’s round. Savioz, who plays out of the Club Med Golf Academy, remained confident that she could bounce back on Sunday. Savioz managed to grind out a final round 77 to edge out Lopez by one stroke and take home her first Challenge Tour victory. Angelica Holman of Fort Pierce, FL took home the girl’s 13-15 age division, while Lopez took home the girl’s 16-18 age division. Jackson Langer of Coral Gables, FL started off the year with a win after rounds of 74-78 in the boy’s 11-12 age division. Kathrine Schaefer of Southwest Ranches, FL captured the girl’s 11-12 age division after rounds of 77-86.